I picked this up from NYPL after reading its summary on Book Riot's August 5th "Fresh Ink" list as a light read to round out my summer. As a middle-grade fiction pick, I wasn't expecting how deep this sisters' tale turned out to be. Summer and Bird are two sisters living with their parents near a lake. They wake up one morning to find both of their parents gone, and set out to find them. The girls enter the fantastic world of birds who have long been without their leader. Meanwhile, the elegantly creepy Puppeteer is attempting to fill the birds' void as part of her own quest to become a bird. Through exploration, separation, and individual growth, the novel develops Summer and Birds' relationship remarkably. As a sister myself, I recognized the complicated and intertwined roles of love, jealousy, and misunderstanding that form this unique relationship. Alongside this true-to-life portrayal is remarkable worldbuilding done in simple, lyrical prose. Plus, bonus points must be given for the ending that was both a twist and made perfect sense in light of the rest of the novel. Overall, "Summer and Bird" is a fresh & fascinating debut from an author I am excited to have found at the start of her career. Verdict: Affirmed. Check it out if you're a fan of unique fantasy and middle grade fiction and/or interested in discovering a talented, new voice in children's literature. 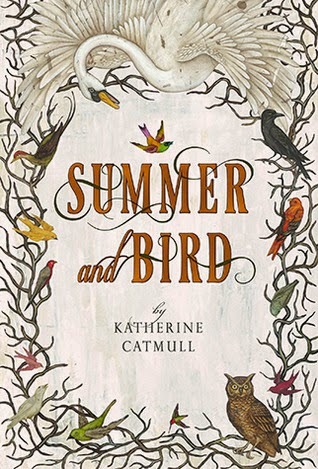 "Summer and Bird" by Katherine Catmull, published by Dutton Juvenile on October 2, 2012, out in paperback August 7, 2014.